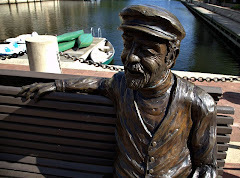 Restonian: News blog from Reston, Virginia, the mauve-colored New Town (tm): Reston's Vibrant Economy Part 34: Where the hell's our bailout? Reston's Vibrant Economy Part 34: Where the hell's our bailout? You know how we keep reading stories in the newspaper about giant banks getting billions of dollars in bailout funds from the federal gubmint to help clean up the mess they created, and then after we're done reading the aforementioned newspaper we throw it into the burning scrap heap we're using as our primary source of heat? Well, turns out one Reston bank is getting some of that sweet bailout action. WashingtonFirst Bank received preliminary approval for a $6.6 million capital investment from the Treasury Department through the Capital Purchase Program, part of the $700 billion Troubled Asset Relief Program (TARP), the bank announced Wednesday. Reston-based WashingtonFirst is among the first local privately held banks to announce a TARP capital infusion. 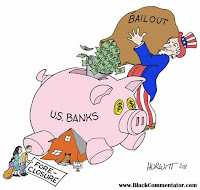 The capital was first offered to publicly held banks. “Participation in this program will enhance the ability of WashintonFirst to meet the credit needs of its community and to advance its strategic plan to extend its presence in the metro region,” said Shaza Andersen, chief executive officer in a statement.